Many miracles have been attributed to the blessing of His Holiness the Third Drubwang Pema Norbu (“Penor”) Rinpoche during his recent incarnation’s lifetime, as well as during and after his Parinirvana. Once in an interview a student asked His Holiness about a particular miracle that had been attributed to him, about lifting a giant rock to be the corner stone of Namdroling Monastery in South India. 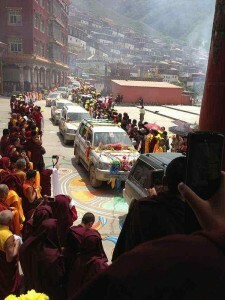 Despite the importance of keeping such a holy teaching in mind, we did want to share with you additional miracles that have manifested during the recent cremation of the body of the Third Drubwang Pema Norbu Rinpoche, in a ceremony known as the “Offering of the Holy Body to Fire” or Kudung Zhugbul. As you may know, His Holiness passed into Parinirvana on 27 March, 2009, accompanied by many miraculous signs. His Kudung (holy body) remained in our temple at Namdroling, Zangdokpelri, for four years so that everyone who wished could come and receive blessings and pay their respects. This year senior masters were consulted and it was decided the time had come to offer the Kudung to fire so that blessings would be able to reach even more widely through the presence of relics, inspiring the minds of practitioners. Tens of thousands of devotees from around the world gathered at Bylakuppe and Namdroling to attend this Kudung Zhugbul ceremony. What follows is an account of this ceremony. 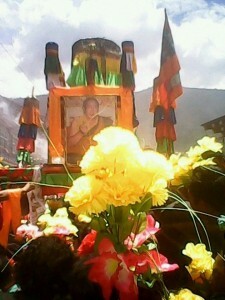 First, during the actual cremation puja, all the attendees felt the power and blessing of His Holiness Penor Rinpoche. As the fire was lit, and blazed to the top of the Cremation Stupa, His Holiness’ face was clearly seen in the flames. Attendees also saw his face appear in the sky, shaped in clouds above. Simultaneously, at Palyul Monastery in Tibet, the traditional monastic seat of His Holiness as Palyul’s Eleventh Throneholder, a full-arched rainbow appeared over Palyul town. After three days, on Saga Dawa Duchen, the anniversary of the Birth, Enlightenment, and Parinirvana of Shakyamuni Buddha, our current and Twelfth Throneholder, His Holiness Karma Kuchen Rinpoche, unsealed the Kudung Choeten (Stupa of the Holy Body). On the level where the Kudung had rested, the large bones were collected into one heap with the head on top and the heart by its side. Small bones like those from the fingers and toes remained in the ash. These relics were collected and taken from the stupa, marched in a solemn procession to the Golden Temple for the Saga Dawa Duchen puja. At the conclusion of the puja, the masters of the monastery gathered the relics, which had been wrapped in yellow silk and brocade, hoisted them high on their shoulders and brought them in a solemn procession onwards to the Tara Temple. There they were to be examined by His Holiness’ close Dharma friend, His Eminence Tulku Thubsang Rinpoche, as well as His Eminence Khentul Gyangkhang Rinpoche, His Eminence Mugsang Kuchen Rinpoche, Khenchen Pema Sherab Rinpoche, Khenchen Namdrol Rinpoche, Khenchen Tsewang Gyatso Rinpoche, and many Palyul tulkus, khenpos and lamas uniquely skilled in conducting such a delicate task. 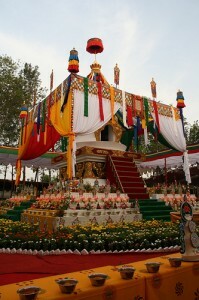 In the north-western part of the land of Oddiyana, on an island in the lake of Dhanakosha, the blessings of all the buddhas took shape in the form of a multi-coloured lotus flower. Moved with compassion at the suffering of sentient beings, the Buddha Amitabha sent out from his heart a golden vajra, marked with the syllable HRIH, which descended into the lotus blossom. It transformed into an exquisitely beautiful eight-year old child. As Guru Rinpoche was born within the lotus flower upon the waters of the lake, the dakinis called out to him from their hearts, and their call spontaneously became the Vajra Guru mantra. So this mantra is his heart mantra, his life core, his heart essence, and to recite it is to invoke his very being. He is known as Tsokye Dorje, ‘Lake-born Vajra’. Vajrapani is one of the eight great bodhisattvas and represents the power of the Buddhas. He is also the compiler and guardian of all of the tantras. On the evening of the removal of the relics, the cremation stupa was dismantled and taken be cast into the ocean. As the sacred pieces were scattered upon the ocean many rainbow appeared and photographs were taken of this. 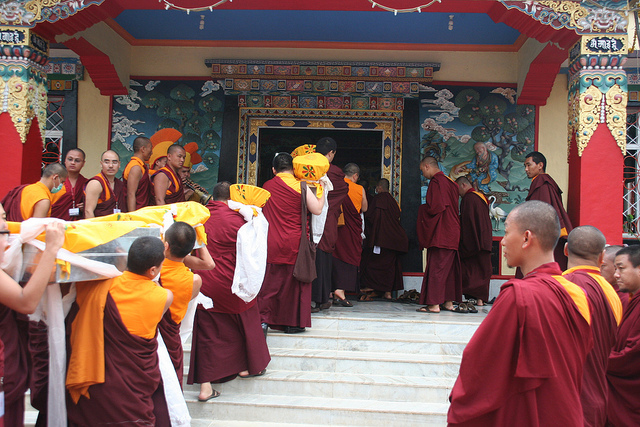 The committee of lamas investigating the sacred remains rejoiced upon finding these relics as the message is clear: We have a pure samaya (holy connection) with our teacher and thus he left us these gifts as objects of veneration to enhance our practice. The committee proceeded to seek out the advice of His Holiness Chatral Sangye Dorje Rinpoche, our most senior Nyingma master, and he gave instructions for the construction of a stupa to be built within the Zangdokpelri Temple at Namdroling Monastery in the center of the main congregation hall. The committee requested His Eminence Mugsang Kuchen Rinpoche to oversee the construction of this stupa with assistance from stupa master, Lama Ngawang. The stupa will be 21 feet high. At thirteen feet, there will be a throne of seven feet in height. The stupa will be unique, constructed of a single piece, as per the instructions of His Holiness Chatral Rinpoche. The throne within will be His Eminence Mugsang Kuchen Rinpoche’s design. The full effort to construct the stupa will require a year and a half to complete. Initially, Tulku Thubsang Rinpoche advised the Namdroling masters to powder all the bones and mold them into Tsa Tsas. 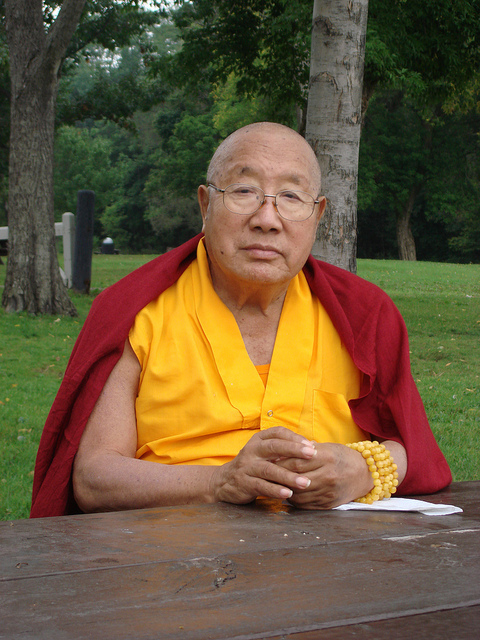 When told about what could be seen on the bones and asked whether they could be saved, Tulku Thubsang Rinpoche granted the request. These sacred bones are now carefully saved. Masters who leave their skull, heart, tongue and eyes usually don’t leave ringsels behind, but nonetheless, many devotees discovered different colored relics around the cremation spot. About 1700 tsa tsas have made from Holiness’ remains but this is not enough to fulfill the many requests from those who want to place the tsa tsas into Kudung Choetens. 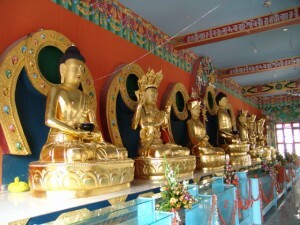 In addition, Namdroling monks and nuns have made fervent requests for the tsa tsas. Therefore, we made more miniature tsa tsas, molded whle the Drublas perform Tsa Drub. His Holiness’ skull has already been brought to Palyul Monastery and one of his bones to Tarthang Monastery. 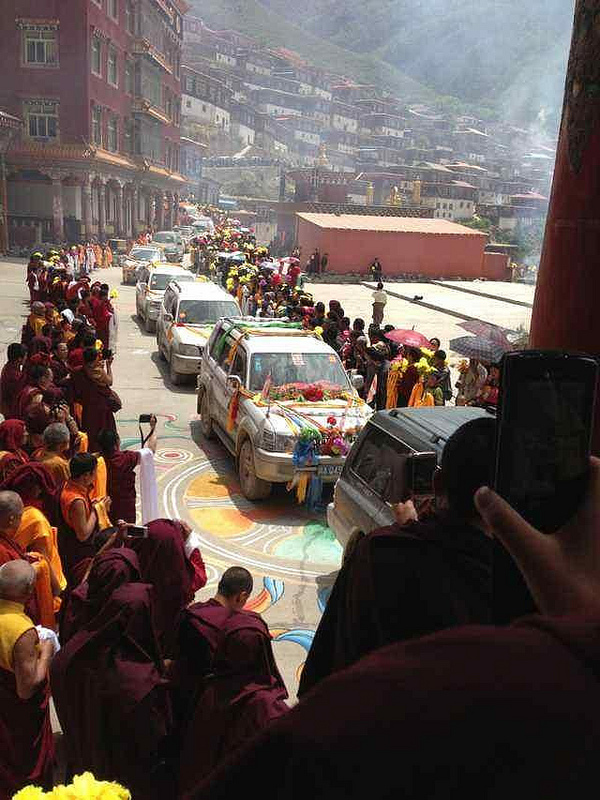 The people in those areas had prayed for many years that they would once again see His Holiness’ third incarnation in this life time, and treated the arrival of the relics as if it was in fact His Holiness himself. They painted the ground with auspicious symbols and gathered by the roadside in a line, holding katag, draping the vehicles carrying the relics in flowers and katag, guiding them with gyaling and other musical Dharma instruments. Everyone who witnessed these ceremonies had tears in their eyes when they saw such devotion to the late Holiness displayed by all who attended, and particularly by His Holiness’ close students. The sky itself opened its heart and displayed rainbows and clouds as seed syllables. But most important, just as His Holiness has instructed in his previous incarnation, all negative thoughts were liberated as no negative thought could remain in the presence of such a sacred event. May all beings benefit and may the presence of the relics of our teacher inspire the minds of generations of practitioners now and in the future. This entry was posted on Tuesday, July 16th, 2013 at 20:35	and is filed under All Posts, Cremation, HE Khentul Gyangkhang Rinpoche, HE Mugsang Kuchen Rinpoche, His Holiness Karma Kuchen Rinpoche, His Holiness Penor Rinpoche, Namdroling. You can follow any responses to this entry through the RSS 2.0 feed. Both comments and pings are currently closed.